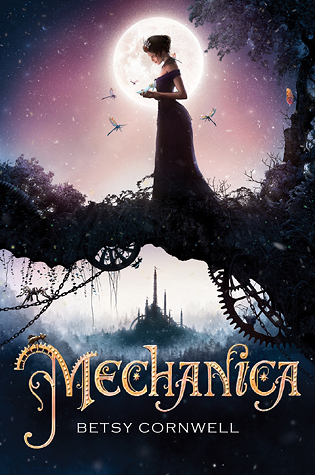 Mechanica takes us to a steampunk world, where humans have just recently tried to banish everything from the the faerie world – including the magical technology Nicolette’s mother specialized in to make her inventions. With both her parents gone, Nicolette is called Mechanica by her stepsisters. It’s supposed to be mean, but she doesn’t mind that much. Luckily, when the Steps turned her into a servant at their beck and call, she had the mechanical skills, learned from her mother, to create machines to help get all that housework done. Even luckier, on her sixteenth birthday Nicolette finds her mother’s hidden workshop. With books and tools and a mechanical menagerie, she begins hoping that the upcoming technological exposition (with an accompanying royal ball afterwards) will be a place where she can earn her freedom. Doesn’t that sound cool? Overall, I loved the world building and main character the most. I liked that Nicolette was this cool, intelligent, inventor-girl, who wanted to stay close to her mother’s home, but also kind of outsmarted the system by creating inventions that would do many of the chores for her. I also liked her entrepreneurial skills and the emphasis this book placed on friendship over romance. I’ve heard a few people online say they have problems with the ending. No spoilers, but I will say the focus is on Nicolette proving herself as an inventor, not smooching. ALTHOUGH THERE DEFINITELY IS SMOOCHING!!! The ending was actually my favorite part. There was great tension and it actually ended in a way that was totally unexpected to me. I’ve also heard some folks say it sounds too similar to Cinder, by Marissa Meyer. I liked (and reviewed) that book. But let me tell you THESE BOOKS ARE TOTALLY DIFFERENT. The technology is different. The plot arcs are different. The worlds and types of stories (steampunk fantasy versus dystopian series) are completely different. I definitely think there are room for both books, and highly highly recommend you preorder Mechanica or put it on your TBR list. This is one Cinderella retelling you definitely won’t want to miss. It comes out August 4th, so keep your eye peeled! *I received an ARC from the author, but all my thoughts and opinions are honest and my own! This entry was posted in Book Reviews and tagged Betsy Cornwell, Book Reviews, books, Cinderella, Fairy Tales, mechanica, retellings, YA, YA Books by Alison Doherty. Bookmark the permalink. Sounds so interesting – can’t wait to read it.